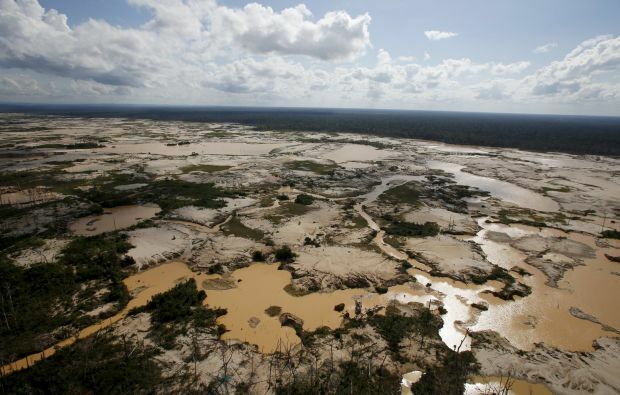 VATICAN CITY (CNS) — The mining industry, especially in the world’s poorest countries, must make a “radical change” to respect the rights of local communities and protect the environment, Pope Francis said. The companies, the governments that are supposed to regulate them, investors and consumers who use the myriad products relying on mined material “are called to adopt behavior inspired by the fact that we are all part of one human family,” the pope said. The Pontifical Council for Justice and Peace, which had sponsored a reflection day in 2013 for two dozen mining company executives and was preparing another session with them in September, was holding a meeting July 17-19 with small organizations working at the grass roots to oppose mining operations in their countries. When local people protest, he said, the response of the government often is to arrest them, rather than investigate their complaints. Speaking at a Vatican news conference, other representatives from groups in India, Chile and Brazil said mining companies — with the approval of local governments — regularly invade and denude the traditional lands of indigenous peoples and poor farmers, expropriate water used for irrigation and drinking and leave polluted land and water behind. The groups, he said, “cry for land lost,” for the extraction of riches that benefit only the mining companies, for harm to locals’ health and for working conditions that treat local employees little better than slaves. Theirs, he said, “is a cry of sadness and impotence for the pollution of water, air and soil” and a plea to be consulted when making the terms for new mining projects.